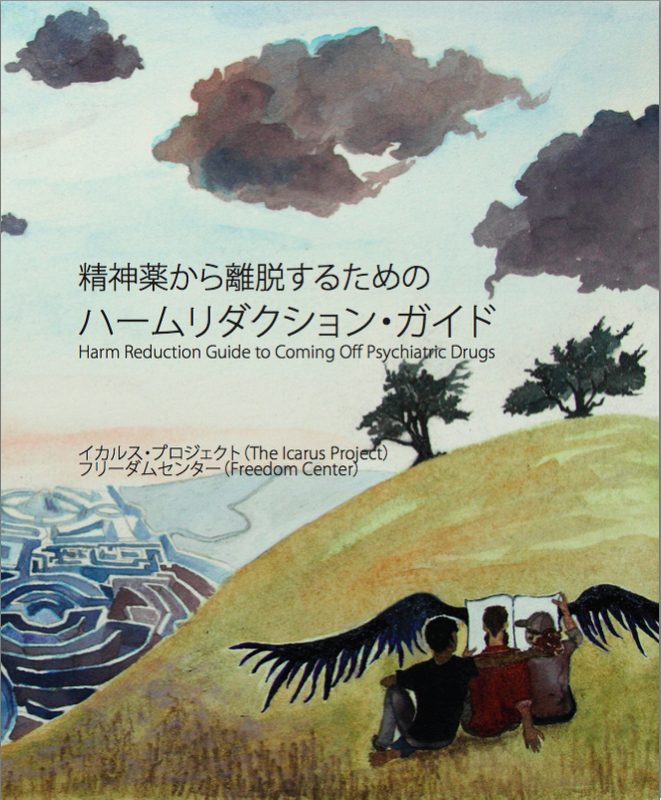 The Harm Reduction Guide to Coming Off Psychiatric Drugs, written by Will Hall and published by The Icarus Project and Freedom Center five years ago, is now available in a revised edition! The new second edition has expanded Resources, scores of new collaborators and Advisors, new topics, more detail on the reducing and coming off process, and additional ideas for harm reduction and staying on medications. The Guide is Creative Commons copyright BY-NC-ND, meaning you have advance permission to copy, print, link, publish and share as much as you want (a special printer ready version is here, with instructions here). Thousands of people worldwide have used this Guide to help themselves and people they know become more empowered around medications, including coming off. Hundreds of professionals and mental health agency staff have been downloading the free guide, to fill gaps in their own knowledge and give to their clients. Now the Guide in its second edition is even better, incorporating reader feedback and new ideas. ● New section with ideas on what to do if someone you know is overmedicated. The second edition revision was written by primary Guide author Will Hall, but was a vast collaboration over several years gathering input and engaging in dialogue. The Thank You’s list has grown to more than 50 people: Ben Abelow, George Badillo, Amy Bookbinder, Dave Burns, Kent Bye, Mick Bysshe, Monica Cassani, Oryx Cohen, Colin, Mary Kate Connor, Laura Delano, Jacqui Dillon, Dionysia Dionysius, Marc Dinacola, Dianne Dragon, dreamer, Sascha DuBrul, Empties, Steve Fenwick, Marian B.G., Vikki Gilbert, Richard Gilluly, Rhi Griffith, Chaya Grossberg, Molly Hardison, Gail Hornstein, Lee Hurter, Jenna, Jonah, Julie, Marianna Kefallinou, Ed Knight, Inez Kochius, Peter Lehman, Paul Levy, Krista MacKinnon, Jacks Ashley McNamara, Tsuyoshi Matsuo, Pheepho, Suzanne Richardson, Olga Runciman, Alex Samets, Sarah Seegal, Seven, Janice Sorensen, Lauren Spiro, Bonfire Madigan Shive, Stacco, Jessica Max Stein, Terramuggus, Amy Upham, Agustina Vidal, Dorea Vierling-Claassen, and Robert Whitaker. After the Guide was released many medication prescribers and clinicians expressed their strong support for its balanced and empowering message. The Health Care Professional Advisors list is now up to 53 doctors, nurses, acupuncturists, counselors, and even a shaman or two: Ed Altwies, David Anick, Ron Bassman, Alexander Bingham, Patrick Bracken, Christopher Camilleri, Michael Cornwall, David Cohen, Celine Cyr, Patricia Deegan, Jacqui Dillon, Kelley Eden, Neil Falk, Daniel Fisher, Mark Foster, Chris Gordon, Jen Gouvea, Mark Green, Nazlim Hagmann, Will Hall, Lee Hurter, Gianna Kali, Peter Lehmann, Bruce Levine, Bradley Lewis, Krista Mackinnon, Daniel Mackler, Rufus May, Elissa Mendenhall, Renee Mendez, Dawn Menken, Arnold Mindell, Joanna Moncrieff, Pierre Morin, Matthew Morrissey, Sharna Olfman, Catherine Penney, Maxine Radcliffe, Myriam Rahman, Lloyd Ross, Judith Schreiber, Michael Smith, Susan Smith,Claudia Sperber, Linda Star Wolf, Peter Stastny, Ted Sundlin, Philip Thomas, Krista Tricarico, Toby Watson, Charles Whitfield, and Damon Williams. Seth Kadish and Cheryl Weigel joined as designers, and the facillitator crew at Portland Hearing Voices played an important role sustaining the work. alter it and you credit the source. You can also order a bound, color cover edition through bookstores.